Its days as a whaling center were long past, but New Bedford was still an important port in the late 1800s. It was the third largest manufacturing city in Massachusetts, and about 500,000 tons of shipping entered the port in 1890 alone. ​Butler Flats Light, built in 1898 for $34,000, replaced the old Clark's Point Light, which had been active since 1804. The appropriation for the lighthouse was Butler Flats was secured largely through the efforts of Congressman Sturtevant Randall. Butler Flats Light was designed by F. Hopkinson Smith, also an artist and writer. Smith's place in lighthouse history is secure largely due to his planning of Race Rock Light in Fisher's Island Sound. Smith also built the foundation of the Statue of Liberty. Built in shallow water with no solid rock for a foundation, Butler Flats Light was a challenge to construct. An iron cylinder 35 feet in diameter was put into place after five feet of mud was dredged. The cylinder was filled with stone and concrete, then the brick lighthouse was built on top. The tower was painted red for a time, but it was changed to white in 1899. The "sparkplug" style light has four stories. The basement served as a storage area. Above that were office space, living quarters which were 18 feet in diameter, and a watchroom. Butler Flats Light originally had a fifth-order kerosene-fueled Fresnel lens, which has since been replaced. 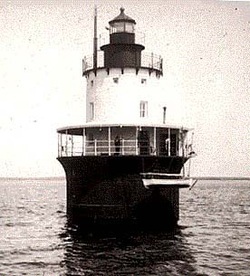 From its first lighting until 1942, when the Coast Guard took over from the Lighthouse Service, Butler Flats Light had only two keepers, Captain Amos Baker Jr., and his son, Charles A. Baker. 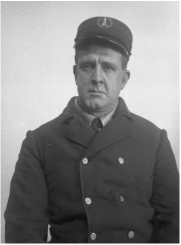 Captain Amos Baker Jr., had been in charge at Clark's Point Light for some years earlier, and his father was keeper there before him. 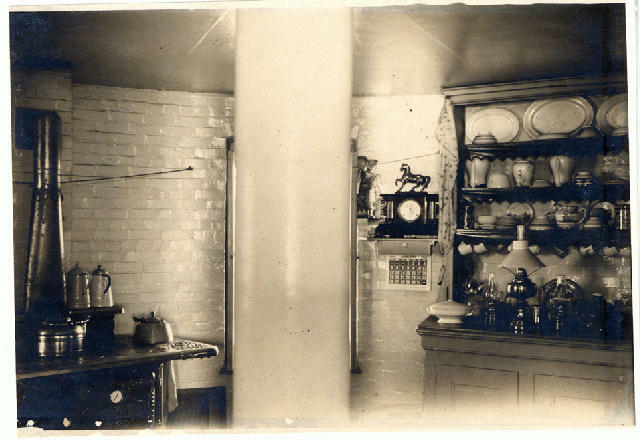 In total, the two lights were kept by the Bakers for about 80 years. At 7 A.M. took charge of Butler Flats Lighthouse with Charles A. Baker as Assistant Keeper. The lighthouse is new but found it very wet and leaky and very dirty and everything topsy turvy. Captain Amos Baker Jr. was widowed twice during his years at Butler Flats, but his loneliness was eased by the fact that his son, Charles, was assistant keeper. He also had occasional visits from his daughter, Amy. A pleasant Christmas Day... Squally in the evening, but we had some music from the phonograph so we had sunshine inside. A fog bell was sounded by an automatic striking mechanism when needed, producing a double blow every 15 seconds. Amy Baker enjoyed saluting passing vessels with the fog bell. To one not used to it, it would seem almost unbearable when going for any length of time, but I have often been told in the morning that it had been running during the night, when I knew nothing of it, sleeping soundly all the while. Vessels are saluted by this bell. Left: Captain Amos Baker Jr. Courtesy of the New Bedford Public Library. The Baker family mostly found Butler Flats Light a pleasant place in summer, but winters were another story. In the winter ice shakes the light a good deal at times and it is scarcely pleasant to have the chair in which you sit shake and realize what might happen if the ice proved stronger than the iron plates of the caisson. In 1905, 200 tons of rip-rap stones were placed around the base of the lighthouse to help protect it against damage from ice. 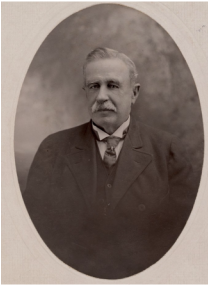 When Amos Baker died in 1911, his obituary recounted his fascinating life. Baker had first gone to sea as a 12-year-old cabin boy on the whaling ship Messenger, of which his father was captain. In 1862, as third mate on the barkStafford, Baker had his leg broken in two places by a whale and spent 80 days on his back. ​By 1874 Baker had beome captain of the bark A.R. Tucker. He was appointed lighthouse keeper at Clark's Point after his second voyage as captain, which lasted 29 months. For 13 years he lived in Butler Flats Lighthouse. Visitors occasionally came alongside, and Captain Baker's cheery, "Come aboard!" always made them glad to obey and see the old seaman's comfortable house. Visitors' signatures in the register while Amos Baker was keeper included that of President Grover Cleveland. Charles A. Baker, who succeeded his father as keeper in 1911, was alone at Butler Flats Light during the great hurricane of September 1938, which battered the south facing New England coast. Someone later told Baker that since they could see from shore that the light was on, they knew Baker was all right. Baker responded, "What a foolish remark. As long as I could crawl, I would get the light going." Charles Baker retired in 1941 and Coast Guard keepers took over the operation of Butler Flats Light. In 1975, a new automatic light and fog signal were placed on New Bedford's hurricane barrier, which had been built to protect the harbor after the devastating hurricane of '38. The Coast Guard deemed the lighthouse unnecessary and it came under the control of the City of New Bedford in 1978. It was automated and became one of the first solar-powered lighthouses in the nation. A private group took responsibility for the maintenance of the light. A New Bedford surgeon, John B. O'Toole, rowed out to the lighthouse every four months to replace the batteries and clean the solar panels. He claimed to have a secret method for keeping birds off the panels. He told the Boston Globe, "Everybody in New Bedford loves the lighthouse." A plaque dedicated to the late Dr. O'Toole is now on shore near the lighthouse. In 1993 the lighthouse was fitted with a new optic, and it was made more secure by the addition of an exterior lighting system. The tower was also made more difficult to enter, protecting it from vandalism. In September 1997 inmates from the Bristol County House of Correction went to work at Butler Flats Light. 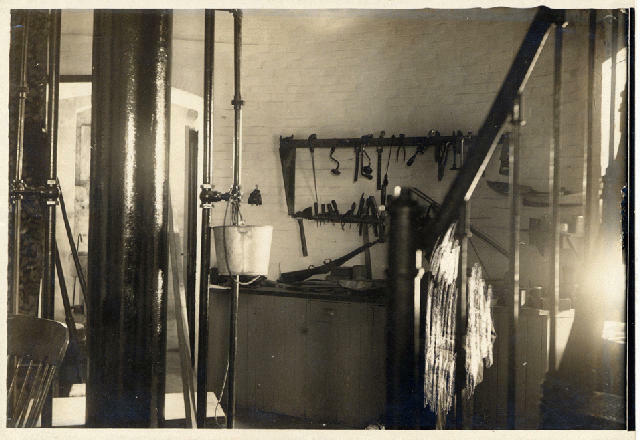 The inmates rewired the electrical system and did work on the tower's walls, ceilings, floors and stairway. On April 30, 1998, more than 600 people attended a celebration of the lighthouse's 100th birthday. A new, brighter optic, powered by a cable from the shore, was installed by Hugh Murray, the retired New Bedford wire inspector who in recent years has headed up the preservation efforts. "Thank you for truly restoring a guardian of the night," said Rev. David C. Hurtle, chaplain of the Seamen's Bethel. Above left: In 1998, volunteer "Keeper" Hugh Murray explained why Butler Flats Light must be preserved. ​Above right: The moment of relighting during the ceremony on April 30, 1998. In the audio file above, Ann Blum Brengle of the Old Dartmouth Historical Society speaks at the relighting event on April 30, 1998. In the audio file above: Ralph Dlouhy, Vice-Flotilla Commander, U.S. Coast Guard Auxiliary at the Centennial Relighting Ceremony of Butler Flats Light, April 30, 1998. Above: Michael K. McCormack, Executive Aide to New Bedford Mayor Frederick M. Kalisz, Jr., reads a proclamation honoring volunteers Peter Duff and Hugh Murray at the Centennial Relighting Ceremony of Butler Flats Light, April 30, 1998. Above: Edward P. Talbot, Chief of Staff, Bristol County Sheriff's Office, speaks about the practice of having inmates from the Bristol County House of Correction do maintenance at Butler Flats Light. At the Centennial Relighting Ceremony, April 30, 1998. City Councilor Victor Pinheiro said, "It means something extra special to all of us who have lived in this part of the city." Anne Blum Brengle, director of the Old Dartmouth Historical Society, read, "Let us hope that Butler Flats may be a guide to sailors for many a long year." 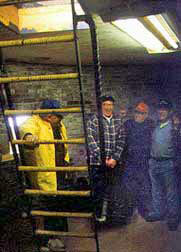 Left: Volunteers Peter Duff and Hugh Murray in 1998. The lighthouse was later offered at no cost to a suitable new steward under the provisions of the National Historic Lighthouse Preservation Act. There were no applicants for the property, so it was put up for auction by the General Services Administration. The online auction was postponed in November 2013 when it was discovered that the access ladder on the lighthouse was damaged, making entry dangerous. After repairs, a new auction was held. The auction ended on November 23, 2015, with a high bid of $80,000. The light has not been an active aid to navigation since 2014. The new owner, Rob Draper, has said, "Our plan is to work with the City of New Bedford and the Harbor Development Commission and other interested parties to restore or rehabilitate Butler Flats as a private ATON – a functioning lighthouse." A good view of Butler Flats Light can be obtained from the New Bedford-Martha's Vineyard ferry. 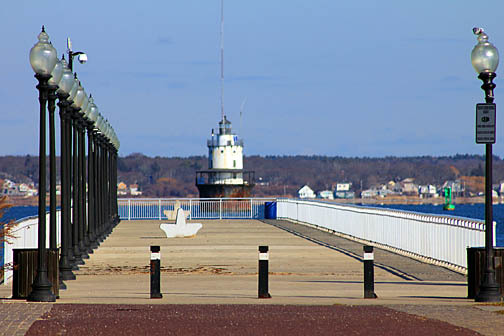 The lighthouse can also be seen from many points on New Bedford's waterfront. The old fifth-order Fresnel lens from Butler Flats is now on display at the Maine Lighthouse Museum in Rockland, Maine. It's said to be one of only two flashing fifth-order lenses ever installed in American lighthouses. One of the best places to view Butler Flats Light is this pier near Fort Taber in New Bedford.